We at ProGlobalBusinessSolutions with our photo post-processing services in India have made the complicated task of restoring or fixing old damaged photos easier by providing best photo restoration services. Restoring old photographs requires experts to give the exquisite finishing to the images. We have years of experience in infusing life to the old and faded photographs that are often damaged with the passage of time. For years, we have been helping our clients with our damaged photo restoration services to keep their special memories intact. Just like any other paper, even images get damaged due to chemical reaction over the years. We provide best photo restoration services in India using sophisticated technologies and advanced version of Photoshop. As an experienced company, we accept and edit various image formats like PSD, TIFF, JPEG, PGF, PNG, GIF, RAW, raw digital files etc. As the pictures get older, they start breaking down. This holds true, especially in case of the antique photos as the paper, chemicals, and technologies used earlier were more prone to moisture and light. 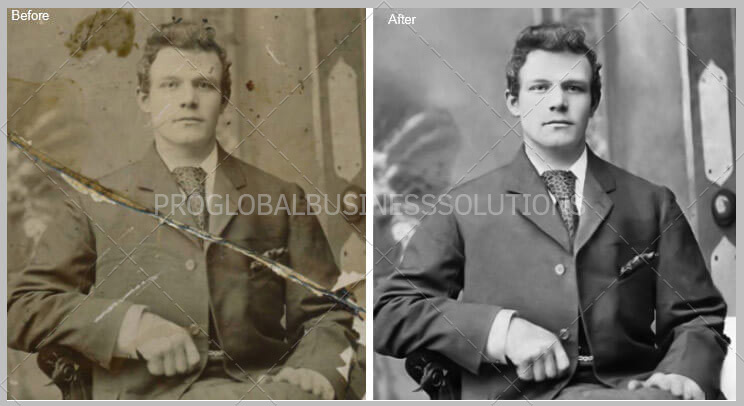 This is the reason for the increasing popularity of antique photo restoration. Using this technique, you can restore photographs, no matter how much damaged the images are. Before the arrival of digital cameras, pictures were snapped. Such pictures were perhaps more valuable as unlike today, in those days taking photographs was not every day or every minute thing. Much more effort and cost involved in the snapping process. Memories were captured through family photos and landscapes etc. and for many, these are the sole reminders of their youth and family. We respect this emotional factor. Light may make the snaps to fade, bending and folding may damage, moisture may discolor and chemical breakdowns may make the pictures to crack or crinkle. The only way by which you can bring back such damaged pictures is via shrewd damaged photo restoration techniques. Changing black and white pictures to color. Remove unwanted people or objects from images. This way we help retain the longevity of the golden memories of people successfully. Hence clients choose to outsource digital photo restoration services to us frequently. How does our online photo restoration process work? Upon approval, we will process the blurry/damaged pictures and send the files through FTP or we-transfer. Why choose us for photo restoration? The benefit of getting digital image restoration services with us is that clients receive excellent work at reduced costs within the assured deadlines. Every client who outsources to PGBS get dedicated executives to take care of their photo editing requirements. To save the time of the clients, we refrain from rework and give required finishing to the images at one go most of the time. Your search for photo restoration ends with PGBS, as we offer a flawless quality of editing at an affordable price for photographers and individuals. We begin by cleaning the damaged prints offered by you. Further, we reconstruct the missing elements and then blend them for smoothing the transition. When the photo restoration and enhancement work outsourced to us is completed, we offer additional services to make photographs presentable; for instance, collage creation, border addition, and creative framing. We make sure your images are secure and kept private. Our experts can take up bulk restoration work and turnaround within short notice. PGBS an exceptional outsourcing company in India offers great benefits to the customers through its organized workflow thus making it easy for them to place orders for various photo editing needs like image enhancement, image manipulation, image retouching etc. Having restored thousands of photographs for customers across the globe, PGBS has its own way of restoring photographs. Our insightful editors are acquainted with the best techniques to recreate the old memories through professional image editing software. We believe that no irreversible damage can ever occur to photographs and we have again and again reinforced our belief by bringing the best out of even the most damaged of pictures. Let us remove the cuts, stains, rips, creases, burns, and cracks on your pictures and make them perfect. Similar to basic, however more advanced color correction, removal of blemishes, scratches, as well as tears and creases are erased. Based on the editing level photo restoration services prices may vary. To know more about how we work, how we charge, how we can support near your location, what all the assurance we provide, read our FAQ’s section. Our customer base is spread across the UK, USA, Europe, Africa, Middle East Asia and Australia. We support professional photographers, studios, museums, archival divisions, companies indulging in digitization and more. We execute optimal level of digital repair needed to propel your photos back to its former glory. Let our team provide you the ultimate photo restoration services in India, flawlessly.